Former FBI Deputy Director Andrew McCabe is speaking to the media about how alarmed the DOJ allegedly was following the firing of then-FBI Director, James Comey. So much so he tells 60 Minutes in an exclusive interview that Deputy Attorney General Rod Rosenstein discussed recruiting Cabinet members to invoke the 25th Amendment. Here’s the problem for McCabe. IT WAS ROD ROSENSTEIN WHO RECOMMENDED TO PRESIDENT TRUMP THAT COMEY BE FIRED. In light of McCabe’s stunning admissions, that fact alone confirms what many have suspected all along. The Deep State was attempting to subvert the will of the American people and negate the results of the 2016 Election because the Deep State’s chosen candidate, Hillary Clinton, lost while the people’s chosen candidate, Donald Trump, won. McCabe confirmed the report in a new interview with “60 Minutes” host Scott Pelley, who relayed what McCabe told him on “CBS This Morning” Thursday. Trump responded in a pair of tweets later Thursday morning. The discussions occurred between the time of Comey’s firing in May of 2017 and the appointment eight days later of special counsel Robert Mueller to oversee the FBI’s investigation into Russian interference in the 2016 election. According to the Times, Rosenstein also suggested that he secretly record Trump in the White House. Rosenstein disputed the account, and a Justice Department official said he made the remark sarcastically. But McCabe told Pelley that Rosenstein’s offer to wear a wire was made more than once and that he ultimately took it to the lawyers at the FBI to discuss. McCabe, who was named acting director of the bureau after Comey’s firing, launched obstruction of justice and counterintelligence investigations into whether Trump obstructed justice by firing Comey. So, Rod Rosenstein goes to the Trump administration with a letter recommending the firing of James Comey. The Trump White House reviews the letter and its findings and agrees to the firing. 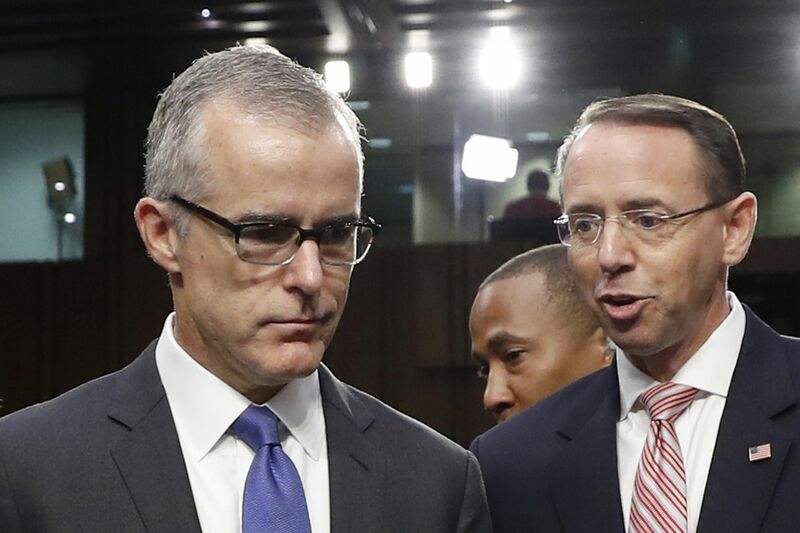 Immediately following that firing both Rosenstein and McCabe use it as legal justification for investigations being launched against President Trump, including, but not limited to, the Mueller investigation as well as ongoing discussion about removing Trump from office – all because the president agreed to go along with Rosenstein’s recommendation that Comey be fired. An avalanche of Deep State leaks to the media ensue, including leaks from former Obama Intelligence officials, all in an attempt to cripple the Trump presidency. (And also don’t forget how James Comey was rewarded with a nice fat government pension and a seven-figure book deal.) The media will of course attempt to spin this admission by McCabe as a story of how chaotic things were inside the Trump White House while in fact it’s an admission of guilt by McCabe for it was him and his Deep State cohorts who were creating that very chaos. Whether you’re a Republican, a Democrat, Independent, or the “I don’t care guy” sitting on your couch right now, we should all agree on how wrong, how criminal, how abusive this entire Deep State fraud has been. The U.S. government is so corrupt, so divisive, so NOT working for the good of the American people and it knows and fears how effective President Trump has been at tearing down that status quo. The #2 at the DOJ who also happens to be overseeing the fake Mueller investigation, Rod Rosenstein, should step down immediately following new information obtained by Congress this week. That is coming directly from Congressman Mark Meadows following a lengthy interview he held with FBI lawyer James Baker. In other words—something’s up and Mr. Rosenstein is definitely in the crosshairs. Based on additional information we've learned over the last week, it is clear Rod Rosenstein should resign immediately. He has not cooperated with Congress, failed to be transparent about his actions, and shown a lack of candor in the way he's characterized a number of events. Rod Rosenstein gave an interview to Wall Street Journal today, after failing to show up in Congress last week to answer questions. By hiding from Congress and making time for media interviews, Mr. Rosenstein has made his priorities clear. It seems transparency isn't one of them.